For other people with the same name, see Thomas Roberts (disambiguation). Roberts was born in Dorchester, Dorset, England, although some mystery surrounds his actual birthdate: his birth certificate says 8 March 1856, whereas his tombstone is inscribed 9 March. Roberts migrated with his family to Australia in 1869 to live with relatives. Settling in Collingwood, a suburb of Melbourne, Victoria. He worked as a photographer's assistant through the 1870s, while studying art at night under Louis Buvelot and befriending others who were to become prominent artists, notably Frederick McCubbin. During this period, his mother had remarried to a man whom Roberts did not get on with. He hence decided to further his art studies, and returned to England for three years of full-time art study at the Royal Academy Schools from 1881 to 1884. He traveled in Spain in 1883 with Australian artist John Russell, where he met Spanish artists Laureano Barrau and Ramon Casas who introduced him to the principles of Impressionism and plein air painting. While in London and Paris, he took in the progressing influence of painters Jules Bastien-Lepage and James Abbott McNeill Whistler. Through the 1880s and 1890s Roberts worked in Victoria, in his studio at the famous studio complex of Grosvenor Chambers at 9 Collins Street, Melbourne. In 1885 he started painting and sketching excursions to outer suburbs, creating camps at Box Hill and Heidelberg, where he worked alongside McCubbin, Arthur Streeton and Charles Conder, working on representing Australia’s light, heat, space and distance. In 1896 he married 36-year-old Elizabeth (Lillie) Williamson and they had a son, Caleb. Many of his most famous paintings come from this period. Roberts was an expert maker of picture frames, and during the period 1903–1914, when he painted relatively little, much of his income apparently came from this work. Roberts spent World War I in England assisting at a hospital. In Australia, he built a house at Kallista, near Melbourne. Elizabeth died in January 1928, and Roberts remarried, to Jean Boyes, in August 1928. He died in 1931 of cancer in Kallista near Melbourne. His ashes are buried in the churchyard at Illawarra near Longford, Tasmania. Roberts painted a considerable number of fine oil landscapes and portraits, some painted at artist camps with his friend McCubbin. Perhaps the most famous in his time were two large paintings, Shearing the Rams, now displayed in the National Gallery of Victoria and The Big Picture, displayed in Parliament House, Canberra. The Big Picture, a depiction of the first sitting of the Parliament of Australia, was an enormous work, notable for the event depicted as well as the quality of Roberts' work. Shearing the Rams was based on a visit to a sheep station at Brocklesby in southern New South Wales, depicted the wool industry that had been Australia's first export industry and a staple of rural life. When it was first exhibited, there were immediately calls for the painting to enter a public gallery, with a Melbourne correspondent for the Sydney press stating, "if our national gallery trustees were in the least patriotic, they would purchase it." Some critics did not feel that it fitted the definition of 'high art'. However, since the wool industry was Australia's greatest export industry at the time, it was a theme with which many Australian people could identify. In this painting, as one modern reviewer has said, Roberts put his formal art training to work, translating "the classical statuary into the brawny workers of the shearing shed". In 1888 Roberts met Conder in Sydney and they painted together at Coogee beach. The younger Conder found these painting expeditions influential and decided to follow Roberts to Melbourne later that year to join him and Streeton at their artists’ camp at Heidelberg. While Conder painted Coogee Bay emphasising on the decorative qualities of form and colour, Roberts’ Holiday sketch at Coogee(1888) embodies his primary focus on the landscape’s natural effects. It is an early testament to Roberts’ plein-air ‘impressionist’ technique, which brought out the sun’s glare on the bright blue sea, bleached white sand, dry grass and spindly seaside vegetation. Roberts' life was dramatised in the 1985 Australian mini series One Summer Again. A "lost" painting titled Rejected was featured in a 2017 episode of the BBC series Fake or Fortune?. It was determined by experts to be a genuine Roberts, dating from his student years in London. Roberts' granddaughter considered it a self-portrait. If so, it would make it his oldest surviving self-portrait. A retrospective toured Australia in 1996-97 and another was shown at the National Gallery of Australia from December 2015 - March 2016. ^ a b c d "Tom Roberts". AGNSW collection record. Art Gallery of New South Wales. Retrieved 6 April 2016. ^ "Melbourne Gossip". The Sydney Mail and New South Wales Advertiser (Sydney). 19 July 1890. p. 145. Retrieved 18 March 2016. ^ a b McDonald, John (12 December 2015). "Review: John McDonald on Tom Roberts at the National Gallery of Australia, a break-away star". The Sydney Morning Herald. Retrieved 13 December 2015. ^ Roberts, Tom (1894). "The Golden Fleece". AGNSW collection record. Art Gallery of New South Wales. Retrieved 6 April 2016. ^ Roberts, Tom (1888). "Holiday sketch at Coogee". AGNSW collection record. Art Gallery of New South Wales. Retrieved 6 April 2016. ^ Chenery, Susan (3 September 2017). "Lost for 136 years: 'fake' Tom Roberts painting bought for £7,500 could sell for $1m". The Guardian. ISSN 0261-3077. Retrieved 6 September 2017. ^ "Tom Roberts, Series 6, Fake or Fortune? - BBC One". BBC. Retrieved 6 September 2017. ^ "Tom Roberts". National Gallery of Australia. Retrieved 13 December 2015. Roberts, Tom. "Notebook, ca. 1894-1895" (1894-1895) [Note Book]. Tom Roberts Manuscripts, Series: MLMSS 1367, File: MLMSS 1367/3. NSW, Aus: State Library, State Library of New South Wales. Topliss, Helen. "Roberts, Thomas William (Tom) (1856–1931)". Australian Dictionary of Biography. Australian National University. Retrieved 5 June 2007. Topliss, Helen (1985). A Catalolgue Raisonne Volumes I and II. Oxford University Press, USA. p. 544. ISBN 0-19-554513-3. 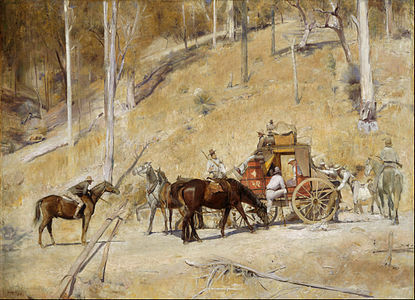 Wikimedia Commons has media related to Tom Roberts.